We offer the best massage therapists and treatments in the area. We offer several treatments that will treat all your issues. Our well trained masseuses are able to adjust the session to any personal preference expressed by the client. We offer an outcall massage service so our masseuses will travel to you hotel room or office. Stimulate your senses relax refresh & revive..
Are you tired? Stressed? Are your muscles tense? There are numerous reasons to get yourself a relaxing massage treatment and why deny yourself this pleasure? A massage can be highly beneficial for both your physical and mental health, it energizes you and it gives you some time to sit back and relax. You don’t need to be a travelling business man in order to be able to book a massage. Everybody experiences stress and tense muscles, treat yourself by taking care of your body and mind by booking a nice and professional massage treatment. Our massage therapists are experienced, well trained and able to accommodate personal requests. If you need certain treatment for an injury or disability, our masseuses will make sure the treatment will work for your body and bodily issues. Our masseuses are accustom to working on various locations. They will make sure you are comfortable to make sure you are able to enjoy the treatment to the fullest. 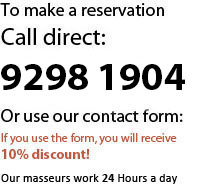 Hong Kong Massage Service offers massages any time of the week. We are able to send one of our masseuses at just about any time of the day, please call us to see when we are able to plan an appointment for you. Please find an overview of our treatments with the prices on our website. Any common questions can be found on our site also. If you have any personal requests please don’t hesitate to communicate them when you are booking a treatment. We guarantee to treat your request confidentially and will do the best we can to service your request.